The traditional books of the paper variety have been around for over 4,400 years. It began about 2400BC when scholars used papyrus scrolls to write the earliest texts. Around 600BC, a general agreement was made by Mediterranean cultures on left-to-right writing and reading. In 295BC, the Alexandria Library was created to hold all the scrolls of the known world. Started by King Ptolemy I Soter. he enlisted the services of the orator Demetrios Phalereus, a former governor of Athens, to acquire the collection. Approximately 40,000 of the 700,000 volumes did get destroyed by fire in 47AD. But by around 200AD, much of the library was destroyed and by 400AD, all volumes were gone. The destruction of Alexandria Library was under the direction of Archbishop Theophilus of Antioch. But eventually the first 28 public libraries were established in Rome, Italy in 370AD. We find the earliest time for colour printing began in 1457AD as seen in the major work known as the Mainz Psalter. In 1753AD saw the first British Library established. First paperbacks began by Tauchnitz Verlag Germany in 1841AD. After 1984, publishers took advantage of electronic tools known as desktop publishing software to prepare and print books (the p-book). Personal computers and laserwriters soon took over traditional printing methods. Only larger publishers continued to use high quality photographic high-speed printing such as coffee-table edition p-books. 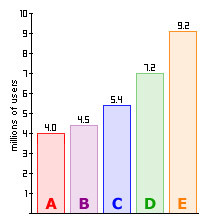 As this graph indicates (1), out of a total 28 million purchases, approximately 9.2 million users purchased p-books and information (E) compared to software (A), clothing (B), computers (C), and CDs and videos (D). Then the next revolution had to be the price of desktop publishing software, computers and printers (except for the consumable inks and toner cartridges). As the prices for these tools came down to an affordable level, more and more individuals and groups started to realise they too could become their own publishers as well as authors of any works they wish to create. Then after 1998, an American software company called Adobe Systems, Inc. came along with a new publishing medium to deliver information in an electronic format showing the p-book can be profoundly affected by technology. The technology is called e-books (based on PDF), and it allows artists/publishers to directly sell their works digitally online through the Web Buy Technology scheme and an online e-business. Once people saw the benefits of electronic delivery of information without printing and a means of delivering the information to anyone using the internet, virtually anyone can be an author, publisher and distributor of information across the globe. How do the traditional big publishers, book shops, printers and everyone else in the book production and distribution chain be able to share in the profits that authors can now potentially make (assuming authors can market and sell their information effectively enough)? How to accommodate the diverse range of small portable devices that could double as e-book readers? The intensely rich designs of a PDF page are difficult to read on small displays. And there are plenty of people happy with the tradition plain black text on white or very subtle grey page background is in a traditional paperback. At the same time, people had developed a simple electronic platform of getting together text and pictures that would originally end up being publish on a web site and just re-package the HTML text files and pictures into a single compressed ZIP file, and called it the ePUB format. Later, Amazon.com added its own means of protecting the ZIP file by creating a Kindle ePUB format and to sell the e-books exclusively on its web site. Apple, Inc. joined the party by making use of its popular iTunes software to make the e-books even more accessible. Combined with the purchasing to the final reading stage on an iPad or iPhone process that is virtually effortless and at the same time create its own file protection technology, at last there is an effective way for companies to make money from the books people were writing, publishing and distributing. These quotes are considered fairly broad and may include such things as CD-ROMs and web pages. However, we shall focus on Adobe's definition of an e-book. The difference between Adobe's definition of an e-book compared to other electronic versions is in the presentation. Whereas other e-books are designed to present digital text in any reasonable manner (often in the ASCII format), only Adobe attempts to recreate a book. Adobe uses technology to convert p-books to e-books in a way that retains the integrity of the original document structure, font style and size, and graphics of p-books. e-books are quick to download and convenient as it can be purchased over the internet from the comfort of your own home. e-books allow information to be found in the quickest possible time through its powerful search engine. e-books can include interactive video, sound, games, hyperlinks to external sources, and childrens' activities. In fact, Versaware's 3 January 2001 survey of students in 63 colleges in 22 states found that 87% believe eBooks are more interesting than p-Books because of their convenience and added features like hyperlinks and audio/video possibilities. e-books can be modified for various reading ages, degree of violence, amount of offensive language, etc. e-books own powerful electronic navigation technology can be easier to use than turning-a-page or several pages at once with a p-book. e-books permit users to customise the viewing experience such as enlarging font size and style, changing orientation of the pages to suit the screen size, increase screen contrast and so on. e-books have bookmarking, highlighting and annotating capabilities. Bookmarks in e-books stay where you put them. e-books can be read in the dark. e_Books can be preserved in its exact original form for all eternity so long as it is copied to the latest electronic storage media. When using PDAs and thin laptops, e-books are highly portable. 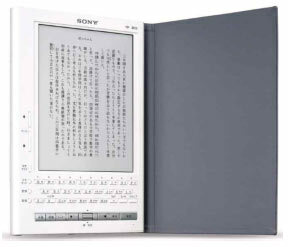 The memory capacity of PDAs and laptops allow users to carry hundreds of e-books at once. e-books don't end up as landfill when discarded. They are merely wiped off the hard disk. Hard to get traditional printed book titles, including those that are backlisted or out-of-print, can be acquire more easily through e-books. Thousands of e-books are now available in the free public domain ready for download. More e-books are being sold with cataloging records thereby reducing time for librarians to process them before putting them into circulation. Many recent titles are being published as eBooks only, hence making the work of librarians in acquiring and delivering to users the information a whole lot easier. The dream of creating a virtual library could become a reality. Librarians may only need to put away e-books under folder categories, keep e-books in their categories (by locking folders), allow users to do a complete search of the library, and never need to let users borrow e-books while temporarily denying others access to those e-books. e-books require less library space, shelf reading, inventory time, weeding, repair and replacement. Authors now have the means of self-publishing and distributing their own works at relatively low cost. Authors can now publish what they want and how they want. No more wondering if the book they signed over to a publisher has been archived in some dark and dingy warehouse, never to be seen again. e-book and internet technology allows anyone who has ever written a book to publish and market an e-book world wide! Electronic files containing the e-text (e.g. on desktop publishing software) can be converted to e-books, and be published and available on the Internet within a matter of days. Compare this to p-books which can take months or years to reach the marketplace. The cost of publishing e-books is virtually zero! Once you have the tools and the know how, creating an unlimited number of e-books costs you absolutely nothing... it's practically unlimited 'profit in your pocket'! There are no delivery or shipping costs! There are no mailing hassles, no shipping headaches, no postage or handling costs or printing costs. Almost all the elements that tend to block impulse e-purchasing disappear! Instant delivery encourages more impulse buying! In our fast paced world, when people decide they want something, they want it NOW! You can deliver your e-books on demand via automatic download or by e-mail immediately after a customer pays for them. Greatly increasing the number of impulse sales opportunities! For business, e-books are great marketing products! They are great lead generators, they are great back-end products and they are great upsell products. e-books are great to give away! By allowing people to download free e-books from your web site they themselves become perpetual traffic generators. People who download your e-book will pass it on to their friends, who in turn will pass it on to their friends... increasing your web site traffic exponentially! Welcome to the world of 'Viral Marketing' - it's inexpensive and it works! Increased traffic results in increased sales! Once you start your own e-book business, and your e-books start to spread over the internet - you won't be able to stop the profits from rolling in, even if you wanted to! Ebooks have a magic little way of floating around the internet for years and years after their initial release. e-books do not use paper  so hopefully fewer forests will be pulped. e-books do not use commercial grade inks and printing chemicals. e-books are only printed if people want to print them. No more warehouses full of millions of over-printed or unwanted books. e-books are delivered electronically so less petroleum products and associated transport vehicle resources will be used. Librarians will require a server to hold all the e-book titles they and their users want and a separate computer to read, translate and present the information. Users may need to bring in their own computers to read e-books and do their research, especially if lots of users take over all the free library computers. Users must be able to afford a computer of their own. To purchase e-books, users must have access to the internet, or visit a library. e-books are not much use to anyone in the event of a power failure. Libraries need to load titles on reading devices (most e-books are dedicated to hardware, so there is no interoperability at this stage Ð though both Microsoft and Adobe are working on software to change this). The archival potential of e-books is still unknown, particularly with competing, proprietary formats that do not fully meet the Open Ebook Standards. Librarians must find ways to fully automate the process of removing user customization of the e-books read before other users can use them. Computers acting as reading devices for e-books keep changing and go out-of-date in a matter of months or a couple of years. Computers are not quite durable devices to handle solid use by the public. Users may feel uncomfortable purchasing e-books online using credit cards. Price of computers to read only e-books is still too high for the mass market. Libraries don't get the same discounts as they do for p-books (up to 40%). Screen resolution is still much below that traditional p-books. Not enough e-books to cover the range of titles needed to fill a library. Titles that may get converted to e-books are only slowly being reviewed by respected sources. Copyright and lending issues still need to be clarified and simplified. The average user prefers to print an e-book that is longer than three pages. Businesses in the book industry still need to find their own ways to make a profit from the selling of e-books. So there are likely to be a variety of different e-book formats and file protection technologies from different businesses all trying to make a profit. p-Books are here to stay. However, the younger market are now so tech-savvy that nearly all are opting for e-books with the right portable e-reading device. Understandable considering there are students from high school right up to university that find carrying lots of books a considerable burden. Hence the advantages of a single e-book reader device to store literally thousands of books at the palm of your hand. But they are not the only ones to see the benefit. In fact, more consumers in the older markets are seeing the advantages of e-books with sales of this new publishing medium reaching 10 per cent of all book sales in 2005 according to Andersen Consulting, and continuing to grow as of 2012. However, for traditional publishers, they remain a little more reserved and skeptical. Of biggest concern to them are the security problems associated with Adobe's e-book technology. For example, a Russian hacker turned entrepreneur by the name of Dmitry Sklyarov discovered the limited protection offered to authors and publishers by Adobe's e-book technology sometime in mid-2001. He set up a business called ElcomSoft for the purposes of selling his own software designed to help customers work out their own passwords for common applications in case they were forgotten. Among the software he was offering was a tool to crack the PDF security codes of e-books. The security flaw was so serious that when Adobe Systems, Inc. finally discovered what happened (thanks to Elcomsoft's web site which advertised the new software) and realised he was on his way to a US conference to present a paper on how he did it, it almost landed Sklyarov in jail by the US Government at the request of Adobe. However, Adobe suddenly dropped all charges against the hacker amid worldwide protests because he did no wrong-doing. The onus was on the customer to do the right thing by using it on his/her own legitimately-purchased e-books for personal use. The only alternative solution is simply to give publishers time to make a profit on the sale of p-books and later produce e-books for libraries to hold in their own collection without expectation of a profit. Indeed, with many of the latest e-book formats including Amazon.com with their Kindle e-book format and Apple's own re-packaged ePUB format with its own file protection technology can now be bypassed and made accessible and open to anyone with the right tools, this may be the only way for traditional publishers to make a profit. It is likely e-books will complement traditional books rather than replace them until all the technological problems are fully ironed out. Data from CommerceNet/Nielsen Media Research, 1999. Landoni, M. and Gibb, F. The role of visual rhetoric in the design and production of electronic books: the visual book. The electronic library. 18 (3). 2000.